One of the best ways to help ensure success towards achieving a goal is to have a specific, measurable and actionable plan. It’s more than just a training plan; it’s an outline of an entire year, or longer, leading up to an important race. Annual training plans are critical tools for elite athletes looking to perform at their peak. Olympic athletes often refer to a 2-4 year plan as they target their next big event. The same is true for ambitious amateurs and age groupers who dream of reaching the podiums. This is why the Annual Training Plan (ATP) has been a core feature of TrainingPeaks’ development since 1999. Thousands of athletes and coaches have leveraged this one-page to outline their picture of success. The foundation of the ATP has always been built on the principles of periodization and how training volume, intensity, and focus can lead to peak performance. But even though the ATP remains a mainstay of successful training, science and training principles continue to evolve, and that’s why we’re evolving along with them. 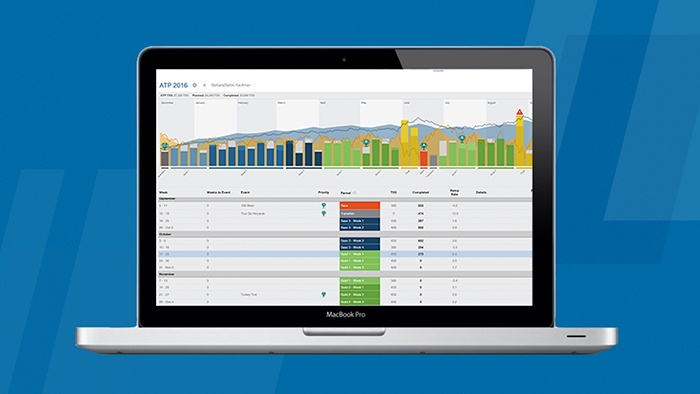 TrainingPeaks is proud to release an entirely new approach to ATPs, including the ability to plan an entire season by using the Training Stress Score (TSS) system rather than just weekly training hours. TSS has been around for more than a decade and used by the world’s best endurance athletes as well as many amateur and age group athletes alike. TSS can power the most useful tracking tools such as the Performance Management Chart (PMC) which allows an athlete to easily see the trends within their fitness, fatigue, and form. The new planning capability with TSS within TrainingPeaks combines the benefits of the Annual Training Plan with the power of the PMC. By combining these two features, you will be able to track what was planned along with what was actually completed so you can stay on target towards your goal. In summary, the value of leveraging TSS within your training is that TSS accounts for an individual’s intensity of workouts and more specifically their own individual threshold values. You can track TSS for cycling via power or heart rate, running via pace or heart rate and swim via pace. Historically, athletes and coaches have described changes in weekly training by the total planned or completed hours. But describing training in hours doesn’t account for intensity, which can play an even greater role in fatigue, form, and fitness. Once an athlete graduates from beginner or novice, training intensity becomes more important than training volume. TSS plays an important role within the planning process since setting a weekly TSS target accounts for intensity. Planning with TSS can be done in two ways. First, most athletes can choose to target a weekly average TSS value in the same manner they formerly targeted average weekly hours. Once a weekly average is set, the ATP will create a periodized program with weekly total TSS targets leading up to an A-priority event. The second method of planning is for more experienced coaches and athletes who also track Fitness (CTL) and Form (TSB). The new ATP can also base workouts on Fitness comparisons between start date and race date, automatically calculating how to reach the target given the athlete’s starting fitness levels. Once the calculations are complete you can customize and edit the weekly values as needed. Another new feature within the ATP is the ability to create customized training periods. This is for coaches who don’t want to describe training blocks using the TrainingPeaks defaults: Preparation, Base, Build, Peak and Transition. With all of these new annual planning features plus some other great updates this week, we hope to provide you with even better tools to make your 2017 season a success. Log in and start planning with TSS now or try it free for 7 days.